1Cook and drain noodles according to package directions; set aside. 2Heat oil in a 5-quart Dutch oven over medium-high heat. Add beef & brown on all sides. Add beef broth, chopped onion, garlic, bay leaf, thyme, salt, and pepper. Bring to boil. Reduce heat, cover and simmer for 2 hours. 3Add carrots and onion wedges, simmer 30 minutes or until beef and carrots are tender. 4Remove roast from Dutch oven, cover and set aside. Remove bay leaf from gravy in Dutch oven and discard. 5In a small bowl, stir together corn starch and water until smooth. Stir corn starch mixture into beef broth and vegetable mixture in the Dutch oven to make a gravy. Bring contents to a boil over medium heat, stirring constantly. Boil 1 minute. 6Toss cooked noodles with 2 cups gravy. Cut beef into bite-size portions. 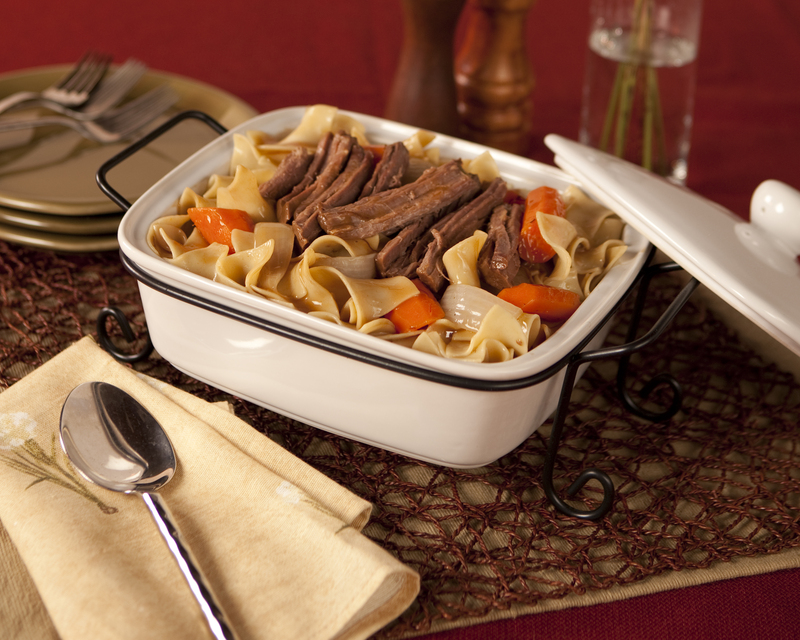 7Serve noodles topped with beef, vegetables, and remaining gravy.